FARNBOROUGH, ENGLAND: The U.S. government is on track to approve nearly $40 billion in foreign military sales in the 2016 fiscal year that ends October 1, down from $46.6 billion last year, a top Pentagon official said on Wednesday. "We're tracking toward $40 billion. 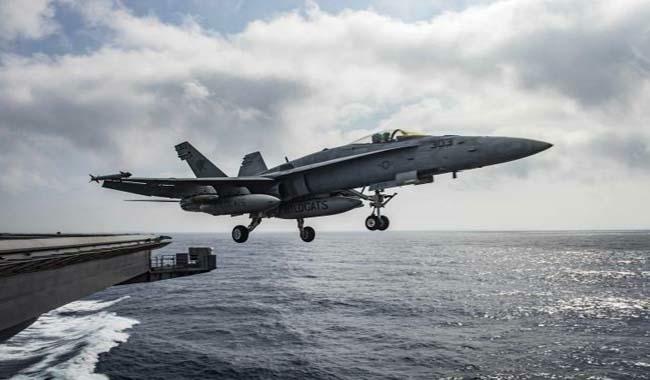 We're tracking toward our forecast," U.S. Navy Vice Admiral Joe Rixey, who heads the Pentagon's Defense Security Cooperation Agency (DSCA), told Reuters at the Farnborough International Airshow. Rixey said the total could still fluctuate, depending on what happened in the fourth quarter. Britain's vote to leave the European Union should not affect its relationship with the United States, or potential future arms sale, Rixey said, citing two large UK arms purchases of Boeing Co (BA.N) equipment announced on Monday. "I'm personally not viewing any impacts to our current relationship with the UK," he said. Global demand for U.S. helicopters and other weapons remained strong, Rixey said. Rixey has launched 40 separate initiatives to streamline the foreign arms sales approval process and respond to criticism about delays in handling a sustained high volume of requests. U.S. industry officials and top military officials have become increasingly vocal in expressing concerns about delays in approving fighter jet sales to U.S. allies in the Gulf and other deals. Rixey said he was working closely with industry officials to understand their concerns, but it was important to look at each case individually. He said his agency does not make policy determinations, but simply facilitates sales once they are approved by the U.S. State Department, Pentagon and White House. He declined to comment on the Gulf sales that have stalled for well over a year now, including a $4 billion deal to sell 36 F-15 fighter jets to Qatar and a $3 billion deal to sell 24 F/A-18E/F Super Hornets to Kuwait, both built by Boeing Co (BA.N). "Anything that is in foreign policy review is actually part of the deliberate conversation," Rixey said. "When we get stalled there, the system is not broken, but actually acting as intended. We’re having a debate about foreign policy." Rixey urged companies to "take the emotion out of it" and be as specific as possible about their concerns. He acknowledged that increased demand for U.S. weapons was creating strains for the government agencies that must evaluate such requests and then process the resulting contracts. "It’s not broken but it’s certainly burdened, with $47 billion (in arms sales approvals) in FY15, and we're approaching $40 billion this year," he said. "We’ve got to make sure that we get better." He said the agency was working to improve training for the workforce and help ensure better contracting outcomes.